"I was a Hillside Farming Agricultural Extensionist Peace Corps Volunteer in Northwestern Honduras in 2000," Ferguson said. “I took three months of extensive language and technical training, mostly related to soil conservation and organic farming.” The group worked a little with coffee production and visited a few farms, he said. Coffee is the second largest commodity traded in the world, just after oil, and it uses more pesticides in its production than any other agricultural product. “Most everything I have is organically grown, fair-trade coffee,” Ferguson said. 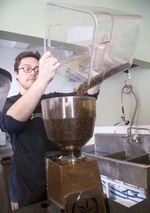 Ferguson opened Cultiva Coffee, which he describes as a micro-roastery, on Dec. 20 of last year. Café Imports, where Ferguson buys his beans, sells direct relationship coffee, meaning the people who buy the coffee have direct dealings with the people who grow the coffee, as opposed to buying beans from a coffee broker, which is basically commodity coffee. “I wanted to help improve the lives of marginalized peoples in coffee producing countries, aka the third world,” Ferguson said. Read more. Donna Tabor, a Nicaragua Peace Corps worker, told them, "We can sell your beans"
In January 2002, the banks were about to foreclose on El Porvenir, this 640-acre cooperative coffee finca, or farm, in northwest Nicaragua. A rustic wooden warehouse held a 30,000-pound harvest in want of a market. Gaitan, the co-op's vice president, listened stoically as Donna Tabor, a Peace Corps worker, told them, "We can sell your beans." Such confidence is characteristic of Tabor, who lives in Nicaragua. But when she presented the idea to Building New Hope, the Pittsburgh-based nonprofit she works with, its co-founder Barbara Wein took a deep breath and wailed, "How are we going to sell 30,000 pounds of coffee?" On the morning of May 7, 2002, a 20-foot truck pulled up to the loading dock at the La Prima Espresso Co. roastery in Pittsburgh. John Notte, La Prima's roaster, had met Tabor the year before when she was in Pittsburgh for a visit. "I'm a coffee man, and these farmers are coffee men," he said, explaining his motivation to help. "I didn't want to just write a check. I wanted to be part of something." What Notte and La Prima owner Sam Patti agreed to be part of was a project to roast the first 2,000 pounds of the harvest for free, the rest at cost, and to sell it in their coffee shops, remitting more than half from the sales to Building New Hope. Meanwhile, the nonprofit shot off an initial payment of $3,000 to El Porvenir to keep the banks at bay. The 43 families at El Porvenir share the anxiety of another lean season. But the cooperative and the nonprofit arrived at an encouraging milestone this month. Wein, with a small entourage that included Notte, made the two-hour, bone-jarring, four-wheel trek up what in few spots only vaguely resembled a road to hand-deliver the last payment. At a makeshift ceremony to mark the occasion, Gaitan and Eugenio Laguna Gutierrez, the president of El Porvenir, sat at little school desks with their guests on a covered concrete porch amid the ballyhoo of chickens and roosters. "Everything you have sent us has gone toward our debt, which is now a very small amount," Gaitan told the group. He said the farm incurred much of its debt to repair property after Hurricane Mitch in 1998. "The policy of the government here is that the poor person does not exist. Had it not been for your effort, there would be 43 more families in the streets. "We know you made a sacrifice to come here," Gaitan said. "Access is difficult, and, this is Nicaragua." He smiled at the chuckles that conceded Nicaragua's status as a tourist destination. "It was a leap of faith on both our parts," said Wein. "But when John committed to roast the beans, how could we say no?" Wein founded Building New Hope in 1992 with her husband, Jorge Portillo, a native of El Salvador. They initially set out to help civil war refugees repatriate in El Salvador, in a village the returnees named Nueva Esperanza - New Hope. Since then, with Tabor on the ground and vigorous in the cause of Nicaragua's betterment, Building New Hope has helped construct and support schools, small businesses, a women's clinic and water systems in Nicaragua and El Salvador. Read more. Coffee is the second most traded commodity in the world and over 25 million people depend on it for their livelihood. After hitting a 30-year low in 2001, the price of coffee has begun to recover. But the extra cents in no way signal an end to the coffee crisis. Despite higher prices, small-scale farmers still cannot earn a decent income. As a result of the crisis, many coffee farmers have lost their farms or have been forced to migrate to cities or other countries. In Colombia, farmers who once could make a good living harvesting coffee often have turned to growing coca, the base ingredient for cocaine. "Though prices have recovered somewhat recently, the effects of the coffee crisis are still reverberating among the many millions of vulnerable people dependent on coffee for their livelihoods," stated Congressman Farr. "Back when I served as a Peace Corps Volunteer in Colombia, local coffee farmers were able to support their families with a stable income. Now that we have rejoined the International Coffee Organization, I hope the United States will be able to take an active role in returning that kind of stability and security to coffee farmers throughout the world." 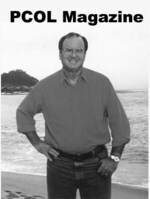 Congressman Sam Farr served as a Peace Corps Volunteer in Colombia in the 1960's. Read more. Read more about the Peace Corps and Returned Volunteers working with coffee growers in Central and South America.